Important to preserving the history of the country grain elevator are the stories and memories of people associated with the elevator -- whether a farmer delivering grain, elevator employee, or someone just driving across the wide open expanses of the prairie. Here are a few that Society members and others have shared. Those in bold are the most recent postings resulting from the American Profile story of Jan. 14-18, 2009. My grandfather used to manage one in a small village called Barons, Alberta. In the year or two following my birth in 1965 he killed himself at his desk. My father found him first. My grandfather was a very proud man. I am told he did his job very well and was a good man. This is the story I'm told by my mother, his daughter: The company accused him of stealing two grain cars of grain. No matter what he did to prove his innocence they would not accept it. His pride would not allow him to be labeled a thief and as a result he shot himself. Soon after the company found those two cars abandoned on a side spur, forgotten by the company. My father, O.M. (Mac) Seaton, was an elevator and feed mill contractor in his early days and built many of the old "cribbed" elevators and feed mills from the 40's through the 60's. He started as foreman for Victor McCurley then later had his own construction company. Also, at one time he was the only Fairbanks Morse scale installer and tester in Montana. He constructed many elevators up on the highline and some of the companies he built for included: General Mills, Greeley Elevator Co., Farmer's Union and various independents. As the concrete elevators became more popular, his type, the cribbed elevator, became obsolete. He suffered serious allergies from the grain dust and his age were factors for retiring. - J. S. S.
When I was a child in the early 1970's I would stay with my grandparents. Their house is no longer standing but it was down the highway from the elevator, actually very close to where the old stockyards were next to the rail road tracks. I remember looking out my grandmother's kitchen window everyday and seeing the elevator. Being a child from California it was not anything we would see living in the suburbs or anything we knew as an elevator. One of my favorite memories that I would laugh and tell my kids about was when there were lighting storms. My grandmother would make us stay away from the windows because she would say the lighting could hit the elevator. Now I don't know if that actually ever happened but I stayed away from those windows. - T. M.
My Uncle Denver operated the one in Sulphur Springs, IN. Wilson Grain was always busy and I was able to "help out" at age 10. From watching my Grandmother keep the books, to mixing and filling feedbags, watching the trains go past, and my favorite activity... chewing a handful of wheat until it turned into gum. And on hot days it was way too satisfying to drop a dime in to the Coke machine for one of those small bottles of Coke. I grew up in Montana and while they were just old buildings to lots of people, the grain elevators were landmarks for my sister and I in the back seat of the car. 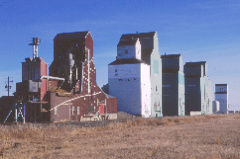 The grain elevator in Carter was the about half way between my mom's house in Great Falls and my Grandma's house in Fort Benton. I went to college in Bozeman and every time I drove to see my mom in Great Falls I saw the elevator in Manhattan and the one in Belgrade. My husband looked at your photos with me and laughed about the name Manhattan. And I told him that he shouldn't joke. That grain elevator meant that I was almost done with my very long drive back to school. We lived in Cascade for a while so I saw that one and the one in Ulm every day. I lived in Choteau, Montana for about 10 years. There is a light on the top of that one. My husband and I were teenagers and he had just moved to this very small town from a city where you couldn't really see the stars at night. He said some silly romantic thing about wishing on "the brightest star over there." I said, "You mean the light on top of the grain elevator?" It's a joke that we tell to this day. Just off of I - 15 between Downey, Idaho and Preston, Idaho is a grain elevator that I awoke to every morning I was at my grandparents home on the west side of the valley on the "string" between Oxford, ID and Clifton, ID. It is in the northern end of Cache Valley next to the railroad that goes through the middle of the valley. Although I never took the ride a lot of the family would ride horses through the "slough" in dry weather to the elevator and then back to my grandparents ranch. The elevator has always held a fascination for me. ..........brought back memories of an 18-year old kid trying to make enough money to enroll in college by painting elevators. Do it again? Never! We slept in mummy bags on folding army cots in the driveways of the elevators, in fact right on top of the grates so the mice wouldn't crawl in with us. We ate a lot of Dinty Moores's stew heated in the can on a hot plate, or even cold. One trouble was that my lead partner, Casey Keltz, had a company checkbook and he could advance our salary and pay for other expenses. Unfortunately we did not take out for taxes so at year's end we owed the government a bunch and did not have it. I suppose every thing that happens when you are 11 years old seems like a big deal-but this really was. 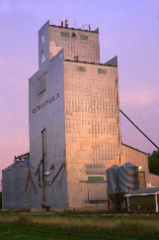 My family bought and moved a grain elevator from a town 3 miles away, to our homestead in Faulk County, South Dakota. Since that elevator is now my home from May to October each year, you could say my future moved too. Times were especially tough on the Dakota prairie in the 1930s, and my family, like many others moved off the farm, seeking a better life in Sioux City, Iowa. Things were not better in the city, and dad returned to farm in Dakota. At an auction sale in 1937, my dad bought a grain elevator in the defunct town of Millard, SD for $200. In the summer of my eleventh year, 1941, farming had improved and my dad and uncles decided it was time to move the elevator to our homestead for family use. The elevator was (and still is) 50 feet tall, 20 feet wide, and 40 feet deep. It has eight grain bins and is built of stacked 2x6s and 2x4s. It had been a Bagely elevator, built in 1900. My dad's brothers, Otto and Julius, began the project just after I returned to the farm for summer vacation. Otto and Julius had used huge jacks to lift the elevator and slide small, wide moving wheels under it. I can remember being in, around, and under everything, but nobody shooed me away. They rented the Faulk County Cat 60, but it could only move the elevator a few yards, so a neighbor's Cat 30 was added. With two additional tractors, we managed to get it 1/4-mile down to the gravel road. It was only 3 miles to the homestead, but they decided they needed to take a 7-mile route to stay on good gravel roads. That's when the Sheriff showed up and said we couldn't go any further because our permit had been denied. After a few days of thinking, arguing and lawyering, my dad arrived from Sioux City and procured some more moving wheels, the Edmund's County Cat 60, and soon after, the Sheriff showed up with our permit. I knew my dad could do anything. With two big Cats, we were in business. I can remember that huge structure creeping along as I raced around it on my bike. We had a couple of close calls. My uncles feared the whole thing would tip over backwards on the hill up to the farm. One of the jacks fell over as we were lowering it onto the foundation, which was pretty scary after bringing it so far. But by harvest time that year, that elevator was full of my family's own grain, as it was for the next 23 years. By 1974, my dad and brothers had long since retired, and I purchased the original homestead and most of the land, including the elevator. Over the last 25 years, it has been my ongoing project to refinish the elevator as a live-in family museum. I have four bedrooms, kitchen, living room, and a dining room sitting on top of an old cook-car chassis. This year I'm working on the third floor soda fountain, because everybody knows a grain elevator's no good without a decent soda fountain. Greenway Elevator is located in a now deserted S.D prairie town, that once had a population of about 140 people in the 1940's. It is located in north central South Dakota two miles from the North Dakota border. This elevator was moved in the 1920's from Madra, S.D. which is two miles north of Greenway. The movers used two horses and a block and tackle! My father was the owner and operator of this elevator from 1940 until 1968. I am presently 51 years old and grew up working in and around this elevator. I helped after school and on Saturdays unload train cars of coal, seed in the spring, and carloads of salt blocks for the area farmers. We also shipped all of our grain by traincar and I can remember "coopering up" the oldbox car doors, and sweeping out all kinds of last load residue, such as sawdust, corn, soybeans, coal, etc. I can still remember the waning days of the local stockyards, which were just south of the elevator. In the early 50's an occasional hobo would stop with the train and ask for a meal. On Saturday mornings locals would sit in the office on wooden chairs and I heard their stories of the 1930's, current gossip, farming tidbits, and would watch the occasional card game. As a young girl in grade school one of my favorite activities was traveling into the country with my Dad on the weekend and visiting all the Greely Elevators along the highline. I always enjoyed visiting with the agents (just like my Dad) and hearing all about the weather and how the crops were looking. Two things were particularly fun. The farmers would bring the grain in their big trucks and get weighed on the massive scales. Then they would dump the wheat and great billows of grain dust would fill the air. The empty truck would then be weighed again and I guess that is how they figured the number of bushels the farmer delivered. The second exciting activity for a little six or seven year old was to watch the pipe coming out the top of the elevator fill the railroad cars waiting on the track along side the elevator. I'd watch that grain come shooting out by the hour. My brother and I used to work in elevators and even built some new ones from the ground up. In 1948 we built a new elevator in Fairview, MT for the Farmers Union GTA. Then went to Brockway to build another new one which took all winter and spring due to the severe winter of '48 & '49. I shall always remember the cold and blizzards and blowing snow out on that prairie. I am a New Englander, born and raised, and until three years ago, I'd never been west of the New York State Mountains. Then I traveled to Minnesota to help a disabled friend return to Massachusetts. I fell in love with the beautiful, flat farmland and with the old and new grain elevators that rise up like cathedrals in my mind. If you have stories to share please email them to the Society.